Regardless of the amount of time and money you spend on landscaping your property, if it is not irrigated properly, the plant materials will deteriorate leaving you with a landscape that looks like an abandoned property. California Creations performs projects of every scale in and around San Fernando Valley, Santa Clarita Valley and Simi Valley. 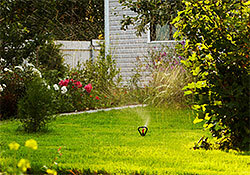 We do not believe in a single “standard” irrigation system. Each irrigation system is unique as it is custom designed to meet your specific needs. We apply significant effort toward ensuring that all plants, trees and ground covers are sufficiently irrigated with minimal amounts of water required. If we design and install your landscape in addition to your irrigation system, we typically group your plant materials based on watering requirements. This makes planning a suitable irrigation system simpler which reduces your cost. Sprinkler Irrigation Systems - These systems are ideal for watering lawns and areas with plants having similar watering needs. They water uniformly by broadcasting water in well-defined patterns. Drip Irrigation Systems - This is an efficient way to conserve water. Rather than broadcasting water over relatively large areas, drip irrigation systems water very small, isolated areas. Drip irrigation systems are ideal for potted plants, deep-rooted plants, vegetable gardens, small and/or narrow planters, watering individual plants and plants in slow-draining, clay soils. Drip irrigation systems deliver slow, steady trickles of water right where it’s needed, at the root systems. Drip irrigation systems prevent water from being wasted in areas where it is not required. This saves money and discourages weed growth. Soaker Hoses - These hoses “weep” water from tiny holes along the lengths of the hoses allowing water to slowly seep into the soil. In addition to designing and installing irrigation systems, California Creations also provides comprehensive irrigation maintenance services. Maintaining irrigation systems is one of the most effective ways to reduce wasted water and improve plant health by applying the correct amount of water where it can be best be utilized by the landscape. We typically inspect irrigation systems on a monthly basis. We inspect controllers (reprogram as needed, test each station, update time and date, check wire connections, replace back-up batteries as needed); check valves and pipes for leaks and obstructions; look for damaged, broken, sunken, tilted and misaligned heads; inspect nozzles for obstructions; etc. We also test backflow prevention devices. This is important to ensure that potable water is protected from contamination or pollution due to backflow. 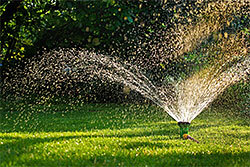 We are fully equipped and qualified to perform all types of irrigation repairs. 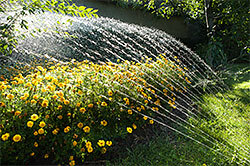 If you have an irrigation problem, California Creations has the solution. We use high-quality materials, have highly knowledgeable and experienced professionals and offer very competitive prices. Feel free to send your requests via this online form or call us at (818) 833-1231.